College Passions is a free dating site for West Virginia college students, alumni, faculty & staff. Join for free and take advantage of free email, chat, forums and more. Mountaineer Singles - The Way Mountaineers Meet! 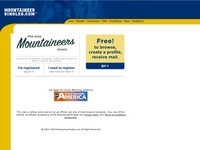 MountaineerSingles.com is a site for single people with a connection to West Virginia University. A service for Alumni, Students, Staff & Friends of WVU. Register for free now. Campus Explorer provides a college matching service for State of West Virginia college students.